I've had a very difficult time wrapping my head around the scope of this oil spill in the Gulf, and what it's reverberations will be. "Better eat fish now," my friend Elizabeth said at lunch the other day. "We won't be able to get any soon." I look at the pictures, at wildlife stuck in the muck, and the mass destruction of ecology and life that is a holocaust. You can visualize how big the impact of the BP oil disaster on your home-town area here. A big, dark spot, huh? And then yesterday I get an email from a young woman - Cathy DePasquale - who I met on a wintry evening at Books of Wonder three years ago, commemorating the life and work of my Gran. She writes: I was thinking about the oil slick and a memory of your grandmother's wrinkle in time came to me. I haven't read it in a long time so I can't be very specific. I remember the good witches telling Meg to look at the Earth and when she did she saw these dark spots on the Earth which were caused by IT. And now we have that dark spot. Just a thought, sometimes writing, which is aimed a larger issues like Madeleine's is prophetic. Cathy, you blew me away. We have a physical, visual manifestation of IT right now, and, like the threat of nuclear bombs in the 1950's, we feel afraid and powerless. At least I do. 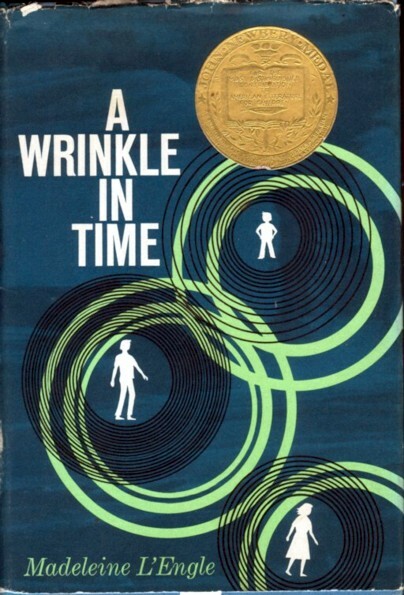 Can we take comfort in the message of A Wrinkle in Time? Is faith enough? Is being true to our creative selves enough? "Who have our fighters been?” Calvin asked. It has to be enough. Our creative selves keep away the demons of apathy, and if we succumb to that wet, cold, blanket, no change will happen, no lights will shine, there is no solution, and nothing will ever get done. But I'm preaching to the choir here, n'est ce pas? It is so true that your Gran predicted MANY things in her writing - she used to say that her writing knew more than she did. When we recorded her reading WIND, I went back and re-read in preparation for the taping. Soon I found myself realizing that the physiological cell challenges for Charles Wallace could have related to our AIDS crisis. The Salon where I do hair modeling is sending cut hair to the Gulf - my four inches is on its way there now to be placed in donated hosiery and used to soak up oil/tar. Do you hear of any Salons in NYC doing this? The 'dark thing' for me is a darkness of the spirit - bigotry, hatred and many people in our world unable to envision peace. As always MaryJo, thanks for more gems and reminders about Gran! Hi, Lena. I felt I needed a Madeleine L'Engle fix and google led me to you. She has been a soul mate since 1964 when i read 'Wrinkle' as a 10 year old. In later years her journals warmed my heart. Geography frustrated my desire to personally thank her for her work but now with internet, Sydney, Australia doesn't seem so far so all the best to you and thank you for preserving her memory. Thank you Agnwilliams for getting in touch . . . I hope that you will enjoy my work . . . in a different way! I live on the Gulf Coast (Alabama) and the impact is huge. There isn't much oil coming ashore here but the loss of work in many industries is a hardship, as well as what is happening to the breeding grounds of the gulf animals--besides the harm to the animals themselves. Thank you for sharing, Wonderwegian. The losses for the Gulf and it's reverberations are/ will-be mind boggling. I hope that you will write about it. A Wrinkle in Time and the Oil Spill is really interesting concept for me which detail mentioned in this post. A lot of impressive effort which detail http://buycheapresearchpaper.com/ and i think both websites is good for the students. Thanks for these sites.